Spacious 5 bedroom/3 bath beachfront home with dramatic views of the Pacific Ocean from Monterey to Santa Cruz! 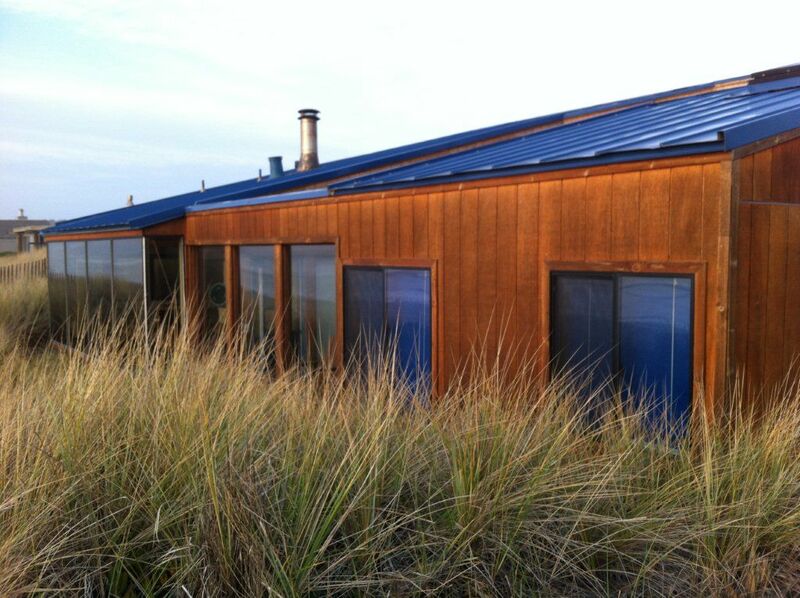 Located at Pajaro Dunes on a secluded expansive beach on the magnificent Monterey Bay coastline. The entire front of the house has windows facing the ocean. The dining table with it's long window seat is perfect for games, gathering and meals with amazing ocean views. This award wining tri-level home is a wonderful place to gather family & friends. One bedroom, one bathroom and the family room (which can also sleep 2) are located on the entry level. Up 6 steps is the main level of the house, including living room, dining area, kitchen, and the master suite with queen bed separated from the main house across the enclosed deck. The third level is 10 steps up, and includes three bedrooms, one bathroom and no bunk beds! The kitchen is fully stocked and equipped for your cooking needs. The separate laundry room includes a full sized washer and dryer. Pajaro Dunes has 24-hour security, biking & jogging trails, tennis, volleyball and basketball courts. Kayaking and bird watching at Elkhorn Slough are minutes away. Nearby cities such as Santa Cruz, Monterey and Carmel are only a 30 minute drive including famous golf courses, restaurants and the Monterey Bay Aquarium. Our family, from Sunnyvale California, has owned House 5 for more than 35 years. Mom continues to live in Sunnyvale, with the kids now living in Pacifica, Los Altos, and Burlingame. Over the years, we have gathered family & friends here for rest, relaxation and rejuvenation! Our fondest memories include playing games at the dining table ... building sandcastles on the beach ... gathering for the Thanksgiving meal amidst God's incredible creation! To answer a common question ... Yes, it is beach front. There are no houses or structures or fences between us and the incredible Monterey Bay! This is an amazing house with an even better view!! Me and my family went out here and chose this place because of the amount of people it can accomidate, super nice guest quarters and kitchen, deck with bbq and a view. Stairs down to the beach right outside the front gate, you can even see dolphins out in the surf in the mornings while eating breakfast if you’re lucky. Definitely would reccomend and will be back!! Thanks so much for the comments. We also enjoy seeing the dolphins and otters in the surf! Glad to hear you had a great stay at our beach house. Very impressed by the location, but even before coming, we realized the property is older and had not been updated for a while. We did find ants in the kitchen and upstairs bathroom. My grandkids had a wonderful time, and must say that all 14 of us had a memorable 2 days stay. We are so happy that your grandkids and family enjoyed our beach house. It has been a wonderful spot to gather our family over the years. We really enjoyed the design of the house, however it rained one night and the room my 88 year old parents were staying in (the separate building off to the left of the house facing west), the roof leaked onto their bed, waking them up in the night disturbing their night's sleep. Owners had to have known about it because we could see water marks on the roof in certain areas of the house. Getting into the house was difficult because the office/gate staff gave us the wrong key three times! We are sorry that you had issues with your stay. Thanks for notifying us of the roof leak; we will have the roofing contractor out again to repair it. We will also review your poor experience with the gate house staff. They are there to help guests check-in and get settled into the house. Perfect home for our large group. One of the best stocked homes we have rented at Pajaro. Beds are not very comfortable unfortunately - went from too hard to too soft, but other than that it's a wonderful home with gorgeous views. Thank you! Thank you for selecting our beach house for your family gathering. We also bring together our extended family to enjoy the beach at House 5. Loved our stay in house 5! We so enjoyed the layout of the house. The huge table right by the window was wonderful! Some loved the protected deck. One daughter missed having an open deck. The kitchen had everything we needed. It was so convenient to be right by steps to beach! Thanks for taking the time to write a review. We so enjoy gathering family and friends around the dining table! Hope that you can return again to enjoy more time at the beach. Wonderful Home to enjoy Family and Friends! Thank you for staying at our beach house. It is great to hear that it worked so well for your family gathering! We hope to welcome you back soon.